I want to put a triple on my Peugeot OU10. because I want to keep the vintage look. and put on jonwvara's 122mm tripizler. 122 BCD Triplizers - Red Clover Components. I like the idea of keeping my old crank. Or replacing my 104 with a Stronglight 99 86mm bcd. The 86 mm bcd has more options for swapping gear ratios around. My real question is "Will they fit?" Will they swap over cleanly, or will I have to get a longer spindle? If I do, is it something easy to find? I have a Swiss threaded BB, that I really don't want to replace. answer without holding the parts in his hand. If you want to use the triplizer, you will need a longer spindle, but exactly which one will depend to some extent on the cups you are now using. Generally speaking, you'll get a good chainline if you measure the drive-side length of your existing spindle (you will need to remove the spindle to do this, of course) and find a matching spindle that's 6 or 7 mm longer on the drive side. If there's a good bike co-op near you they likely have a drawer full of assorted spindles for you to try. Another option would be to replace the existing Swiss bb with a Grand Cru threadless BB, which costs about $50, I think. 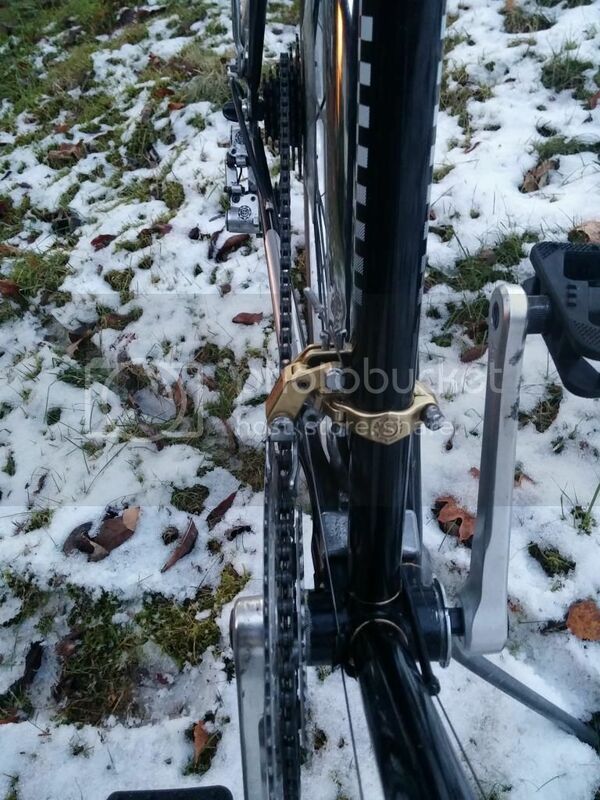 You might be able to sell your existing Swiss BB on ebay for that much if it's in good shape. 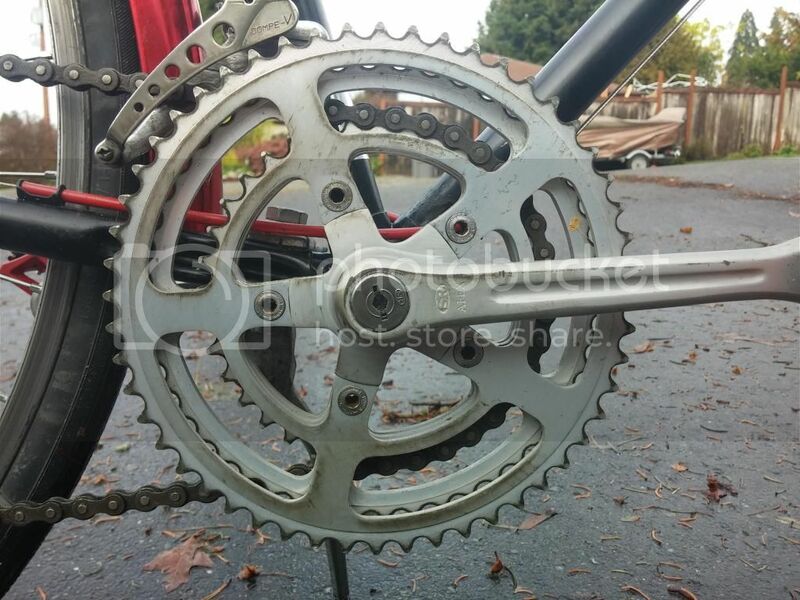 If you can live with a 37-tooth ring for a low--I'm guessing you have a 42 on there now--you could keep it as a double without having to make any changes beyond switching chainrings. Going to a freewheel with a 34 big cog at the same time would give you a sub-30-inch low--not far below what you find with a lot of triple setups. I also like the 86 BCD cranks from Stronglight and others, although the smaller rings for them are not always easy to find. Yes, I've read through Jon's web site. I watched him do it. had a longer spinal replaced already. I know the bikes are different, that's why I was asking. You're talking about an 86 bcd Apex, which can be set up as either a double or a triple, correct? It was probably originally set up as a triple, and so had a spindle suitable for a triple. At some point someone probably reconfigured it as a double without changing the spindle. That wouldn't have given an ideal chainline, but would have worked okay. So then when you made it back into a triple, you were setting it up as it had been originally, with the proper spindle for a triple already in place. That's just a guess, but it seems like a probable scenario to me. Thank you for replying Jon. I am not the best bike mechanic. I would not know what to look for, in a bin of parts. so I don't what to waste anymore of his time than I have to. Is a longer spindle something that be just be ordered from a catalogue? I just don't like the threadless bb. I think they are a last resort. It's just personal. And Phil Wood stuff is pricy. I really like your 37 tooth option. I'm riding now with a 52/40 rings with a 14-28 six speed. I live in a hilly area, and some of the hills here I'm borderline making it up to the top. a lot less overlap of gears. So it's more than just one lower gear. If it comes down to having to replace the bb, I'll probably go that way. Is this what is meant by the chain line? The chain looks really straight from the small ring to the large sprocket. when ahead and replaced it with a longer spindle. Who would know, might even be better. Yes, of course, I should have thought of that--super mirages did come with that SR crankset, which I'm quite sure had an appropriate spindle for a double. Maybe the SR has a much lower Q-factor, and so doesn't require as long a spindle? I'm too lazy to look it up, but it could be the same spindle worked for both cranksets. I had to look up what the Q-factor was. It's not something out of Star Trek. there must be someone out there that's tried this before. Or is the rest of the world flat? FWIW, I've done several triple conversions, and never needed to get a longer spindle. Chainlines are good in all ranges and would be negatively impacted overall with a longer spindle. When I ran a Stronglight 99 triple, I used a Stronglight 125 spindle. You'd likely need the same for a triplized mod 93 as well. when ahead and replaced it with a longer spindle. Who would know, might even be better. The UO10. The goal of chainline is for a triple to get the chain straight on the middle chainring and the middle sprocket. The desired result is so that the chain deflection is the same for the little-little position and the big-big position. You set it by in the front for a triple by measuring from the center of the middle chainring to the middle of the down tube, and that should be 45.5 mm (maybe it's 46.5? I'm sure someone will chime in with the correct numbers) within a millimeter. If it isn't right, you need to check that the BB is correctly installed, and if it is, you need a BB of different spindle length. Actually it's the length on the drive side that is really important. 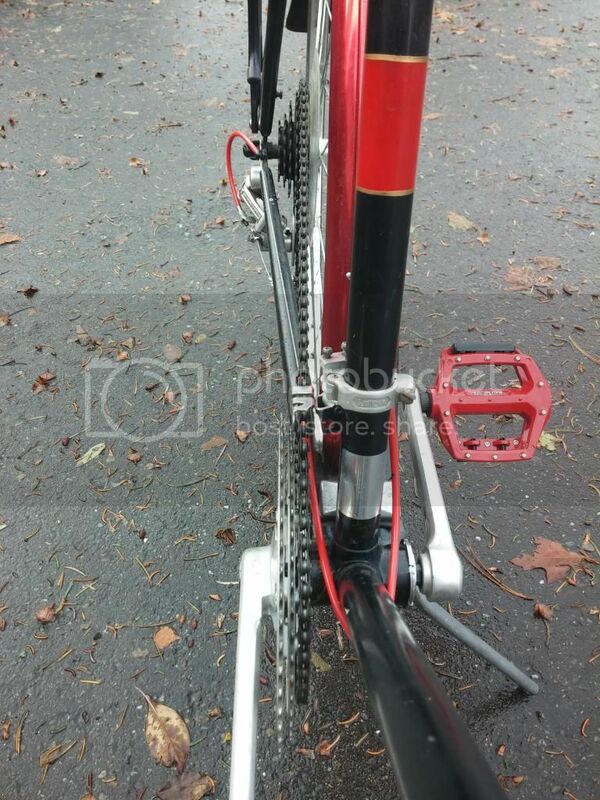 In the rear the freewheel or cassette position is essentially automatically correct if the frame is aligned, the hub spacing is correct as new, and the freewheel or cassette are the type originally intended for the bike. Mismatches with a freewheel bike can be resolved with careful adjustment of the lateral position of the hub between the dropouts, re-dishing of the wheel, and possible choosing a different freewheel. Freewheels can also be shimmed on the hub to move them farther from the center of the bike. Yours looks like you have a 5-speed rear which normally wants a 120 mm frame. But the big gap between your small cog and the drive-side dropout suggests you actually have a 126 mm frame and hub, which would match up better with a 6 speed or 7-speed. 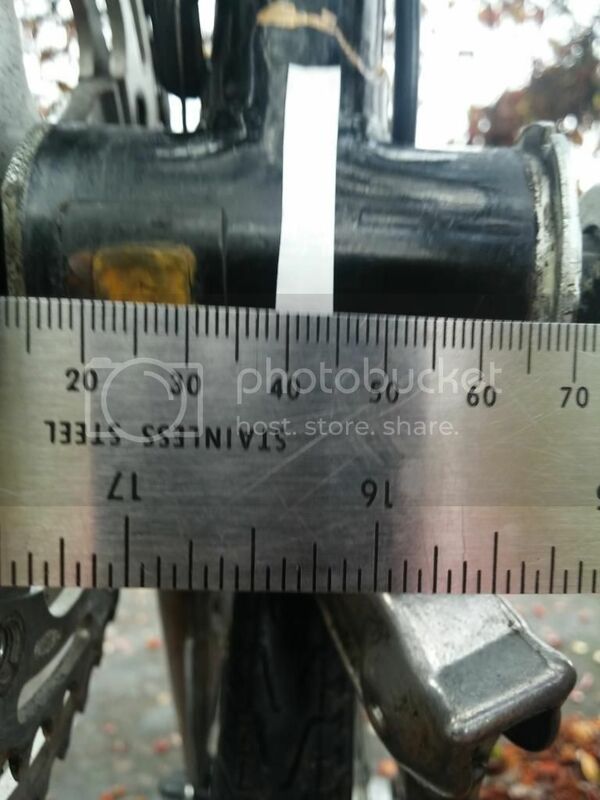 You set it by in the front for a triple by measuring from the center of the middle chainring to the middle of the down tube, and that should be 45.5 mm (maybe it's 46.5? I'm sure someone will chime in with the correct numbers) within a millimeter. If it isn't right, you need to check that the BB is correctly installed, and if it is, you need a BB of different spindle length. So if we add 1or 2mm, it looks like it's 40mm. You can see where the paper label was. I peeled it off to save it. You can also see where I pinstriped the lugs myself. I got a little sloppy on the bottom. The UO10 has a factory 6 speed freewheel. The red Super Mirage does have the factory 5 speed freewheel. It does look odd with all that space in the back. 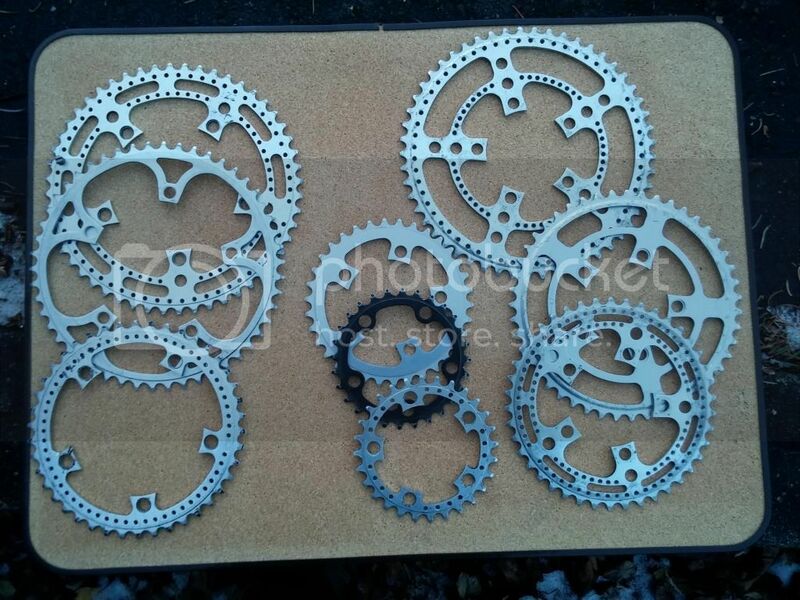 A new 6 or 7 speed freewheel is a different project. An update on the project for any future reference. I'm very happy with way the project turn out. I went with a Stronglight 99 crankset. Obsolete but fairly easy to find on ebay. With a 32 tooth granny gear from Hilary Stone in the UK. when they said I needed a longer spindle. The bike went from a 119mm to a 124mm spindle. I didn't need to change my Swiss BB. 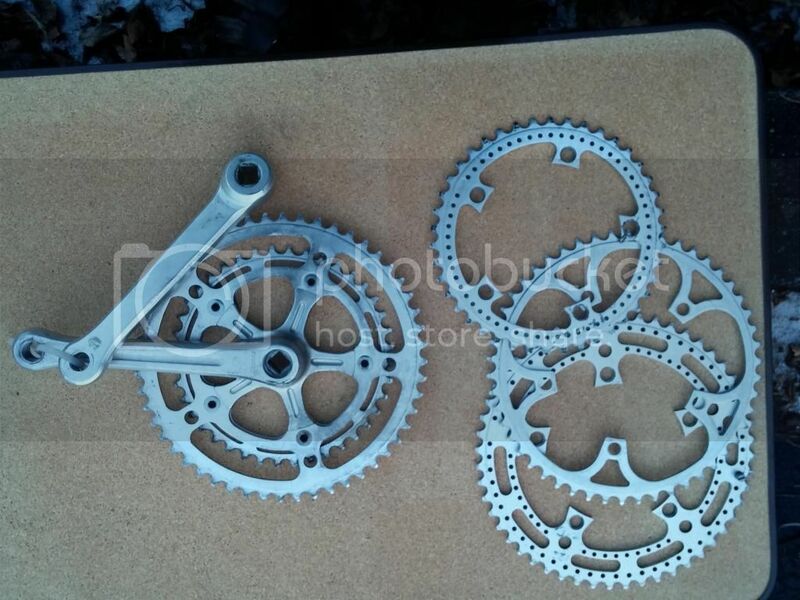 to a 52/40/32 crank with the same 14-28 freewheel. using the original drivetrain parts. Went to the local bike junk yards looking for a crank and rings. 86mm rings for the Sronglight 99. Five dollars a piece, this is where the cost of the project went up. but I couldn't pass up on the BIS rings. Probably make the crank more desirable when I go to sell it. Please don't look to closely at my first attempt at drillium. I was bored over the Thanksgiving holiday weekend. I know now, how to do it better the next time. plus do the work themselves, this project could be done cheaper. do the work for me, it was done for less than 150 bucks. roughly the same price, and by far, quicker and easier. Last edited by Rocky Gravol; 12-04-14 at 02:53 PM. I always "try" for the shortest-possible spindle, given the limitations of chainstay clearance and the front derailer's ability to pull the chain down to the granny ring. Since I have no reason to run the chain out to the smaller cogs when using the smaller chainrings, in search of redundant ratios and with the chain slapping the chainstay with every bump in the road, I try to achieve a centering of the big chainring with the center of the freewheel. This allows me to freely use the full range of cogs while riding in the big chainring, using the smaller rings as bail-outs. Again, I do have to assure that the front derailer will shift reliably to the smallest ring as I shorten the spindle length. Older Apex and Stronglight cranks often tend to allow chain skating across the widely-spaced chainrings, moreso when using the narrower chains that I prefer for better rear shifting. Usually even using 8s chain requires some beveling of the smaller ring's teeth to encourage the chain not hanging between chainrings where it can do some damage to the chainrings and cause other havoc. I have forcefully threaded a Shimano UN71 bb into Swiss-threaded bb shell, then using a Stronglight 93 crankset on the 115mm JIS spindle. The results were good though the front downshifting is less forceful since the chainrings are more inboard from the new bb's lack of offset. The JIS taper did make up for the spindle having been shortened from 118 to 115mm, just the offset is gone so net loss of a few mm there. It does seem that the OP fortunately has a decent shop available, having the needed spindles to choose from and getting it all working. Last edited by dddd; 12-04-14 at 01:56 PM. TA also makes a 130 and a 135 triplizer. 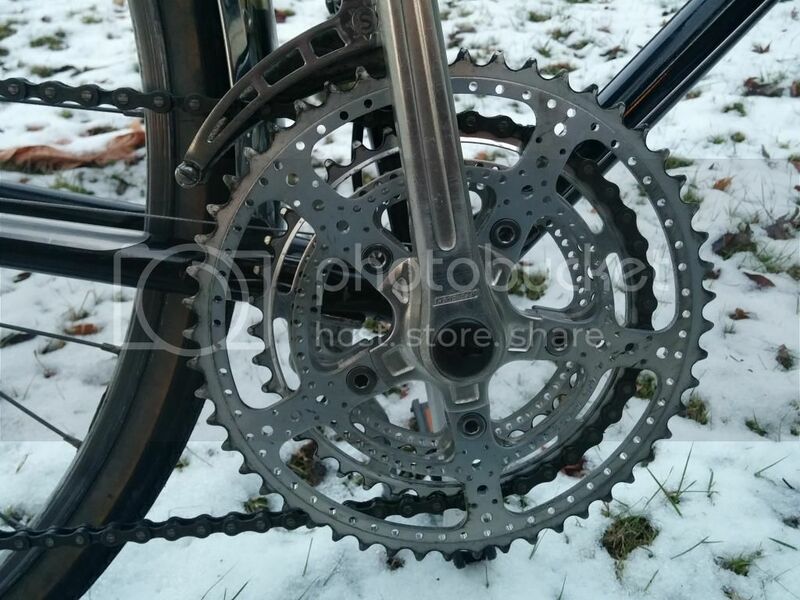 But I'm damned if I can see how that Stronglight intermediate porteur triple can possibly be installed on a crankset unless you first grind off the "ledges" that center the chainrings (see Red Clover Components - Blog). I would be delighted if someone who has direct experience with one of the Stronglight 130s would explain how it works, or better yet post a picture of one installed on a crank. Last edited by jonwvara; 12-04-14 at 02:20 PM. so It + a longer spindle would do . the trick . 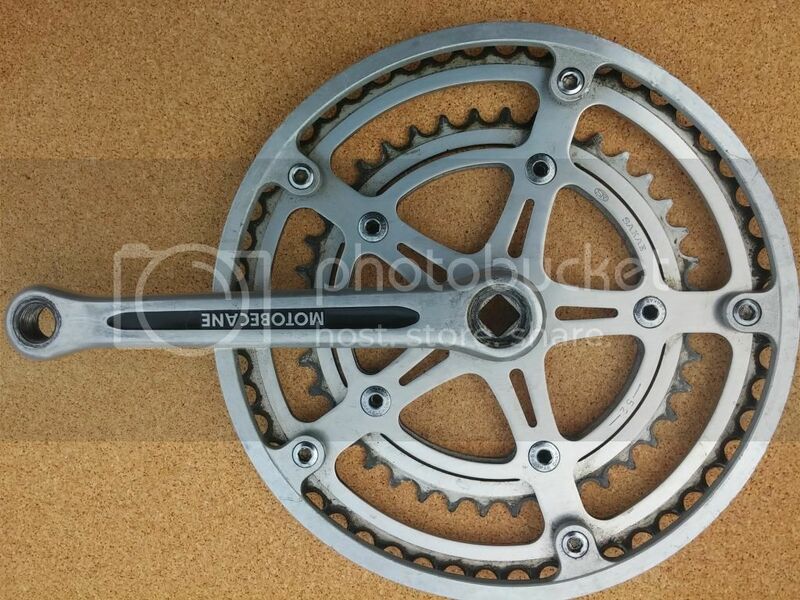 ** Campag Record Off Road crank did Similar, Back In The Day ..
How do you mount this on a crankset with shelves/ledges? 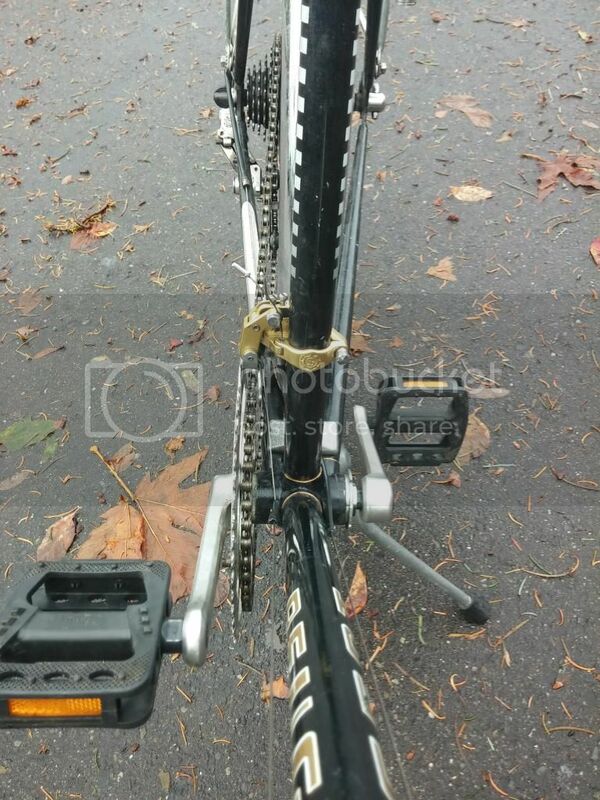 Or does it only work with those cranks that don't have ledges? Read again.. I was referring to a different design..
Chuck a cut off an Old square taper BB spindle in a Lathe. Mount the crank on it. and machine off the shelf if you wish . to get it good and Flat. a decent machine shop can do that in an Hour. doesn't matter, they just took off the plastic trouser guard. you may be happier with the offset types .. they have been around from various sources for a while, ... Happy Shopping.. Okay, thanks. I'm still confused, but that's normal for me. Before you get too far into this, I suggest an easy thing to check on your UO-10. Measure the distance from the inside of your inner chainring to the chainstay at the diameter of the inside ring you plan to put on. Now measure the distance from the inside of the outer chainring to the inside of the inner chainring. If that is as large as your first measurement, the teeth of the new chainring will be very close hitting the chainstay. But if it is even just a small amount smaller, the new ring should fit with no changes to the BB axle. Yes, the chainline isn't "ideal". You may not be able to use your smallest and next to smallest cogs on the inside ring. Purists will say you shouldn't anyway. Possibly your front derailleur will not move in far enough to do the shift but if it made to handle a triple, I would be surprised if that happens and I would just go try another. Doing this first (if it works) means you will get to where you want to be without taking everything apart, only to find that your new, longer BB axle is designed for slightly different BB cups (say with cones that have fatter shoulders). This would place the whole axle further to the left and negate the gains you expected. Stronglight has been around many years. I highly doubt that there has been no design or tooling changes over the years. Well, it's already been done, and I'm happy with the results. and on a loose fit it appeared to work. But when it was tighten down, it showed itself to be to short. I think I could tell the wider Q-factor, but it might've been in my head. Anyway I've already adjusted to it. it fits best for my riding. could be used without more modifications. the local dealer for French bikes. So he likes vintage French bikes, if only for nostalgia. he puts them out on the floor so people can admire them. So I tend to trust him and his techs. Except he was putting pressure on me to upgrade to a TA crankset. SR Apex I used to tripleize my Super Mirage, in the photos above. so that's not a option anymore. A Mountech front derailer will accommodate the widest range of possible gearing, especially different sizes of middle ring. Newer derailers tend to be designed for specific gearing step increments, such that the cage may rub against the middle ring when the largest ring is engaged. I've used standard front Cyclone derailers for various triples with 34-52t total range, and the smooth cage plates weren't fussy about the particular gearing increments. It even indexed perfectly with a 7-speed-era SIS front shifter!